*As of April 1, 2019 NO Surf Credits may be redeemed for food or alcohol on property. 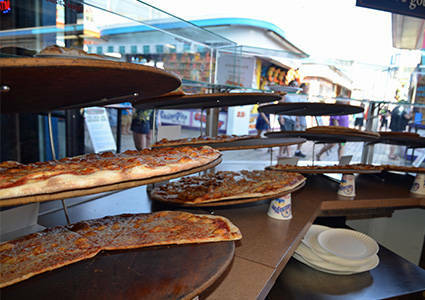 Take a stroll down our boardwalk and you will see a variety of food stands to tempt your appetite…stop in at our flagship stand – the Pier Grille (located inside the Casino Arcade) for the BEST pizza in Seaside Heights! If you have never had pizza in Seaside, you do not want to miss this experience. You will also find classic boardwalk favorites like cheesesteak and sausage, peppers and onions sandwiches to tempt your taste buds, among a variety of other great food served in our comfortable and clean dining area. Open everyday during the season, and weekends in the winter, you can watch your favorite games on TV and enjoy a great meal anytime at the Pier Grille. 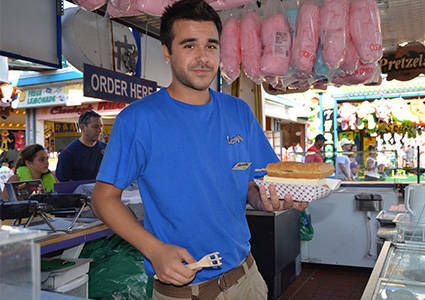 Curley Fries (located near the enterance to Casino Pier) serves the areas freshest french fries, zeppoles and funnel cakes all made fresh to order! Old Fashioned Waffles & Ice Cream makes the best and biggest waffles and ice cream on the boardwalk right in front of you while you wait – just like you remember when you were a child! 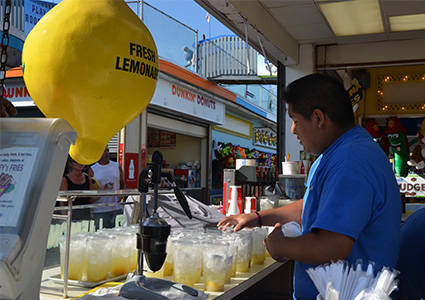 On the property you will also find Dippin Dots and Scaras Italian Ice among several other food locations. There are plenty of places for you to enjoy the boardwalk cuisine when you visit our property – there isn’t a reason to go anywhere else! 2 locations! Under Wacky Rooftop Golf & at Breakwater Beach.